There are so many different things that we like, and so we talked about having a page for maybe a song of the week, a book, a movie, a game, a video, or something along those lines. In the end, we just couldn't decide on any one thing, and so that leads us onto how our 'Favourite Thing of the Week' came into being. Things come and go, but some deserved to be celebrated and remembered in this way, and so we've really enjoyed carefully choosing our items, photographing them as best we can, and documenting these wonderful items. Do you agree with our choices? 'Things' are often subjective though, aren't they?! 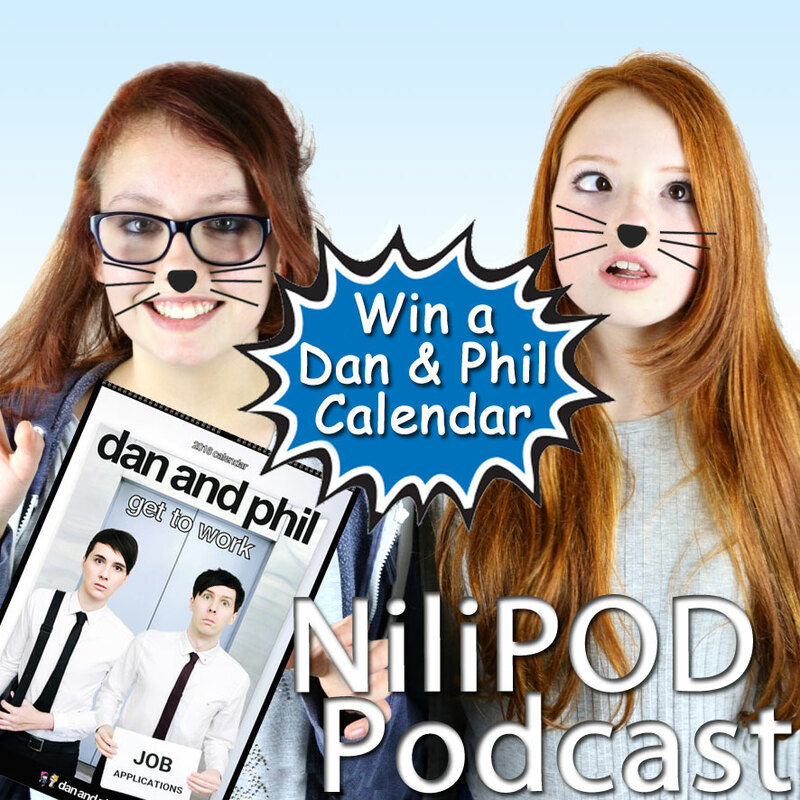 Of course, this week's thing really does have to be our amazing Dan and Phil Calendar Competition. The YouTube subscribe button is a truly wonderful thing - it can make people's dreams come true. We thought that we'd celebrate this magical and mysterious red rectangle, by making it our 'Thing of the Week'. Why not pop over to our YouTube channel right now and see what happens when you click on this button and subscribe to the NiliPOD YouTube channel. It changes colour, it sets of fireworks and it makes the sky turn purple - and least one of those is completely true, click to see which one: Subscribe to the NiliPOD Youtube channel. The other day, Liv and I went to Lyme Regis just to have a day out really, because it was sunny and not raining, as it has been for so long lately. We have filmed a vlog from right when we get up to when we are driving back in the car, so when that is uploaded, you should go check that out - wink wink, nudge nudge. But yes, it was a great day out and we set up a huge fire on the beach, and then it started spitting hot stones like a volcano, so we quickly evacuated. Has anyone else ever set up a bonfire on the beach and had explosions like this? I know we have. 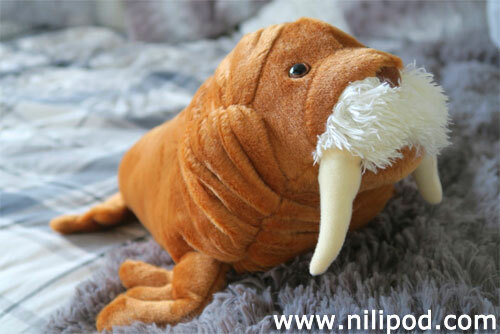 For Christmas, I got a walrus... Not just any walrus - Mr Tusk! So back in February or March, I watched a movie called Tusk starring Johnny Depp and Justin Long, and it was HORRENDOUS. NEVER WATCH THAT MOVIE. YOU WILL LITERALLY NEVER UNSEE IT! For Christmas my dad had a funny idea to give me some 'merch' - some half-human, half-walrus merch. Thanks dad! No, but in all seriousness I love it and it is very soft. It would be perfectly lovely if I didn't think of that movie every time I saw it. Christmas is certainly coming round the corner, so Nia and I have decided to have our Dan and Phil Advent Calendars as this week's things of the week. 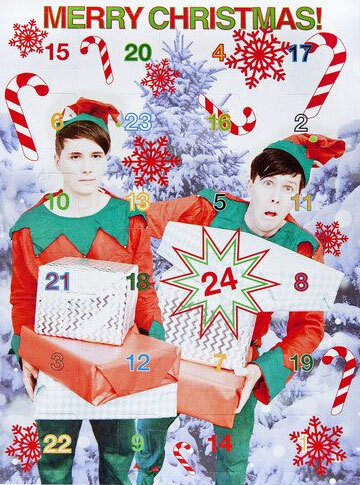 Every time we open a door there is a really funny photoshopped picture of Dan and Phil with something Christmassy. The chocolates inside inside are amazing and Nia and I love opening them up everyday! 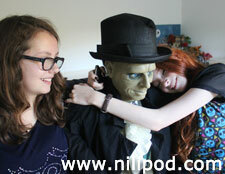 If you want to see our daily reactions, when we open the doors, please check out: #niaandlivopenthephanadventcalendar. 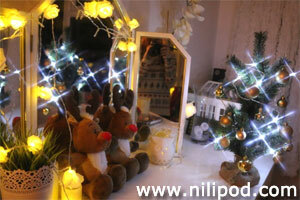 I'm pretty sure that everyone knows Christmas is coming, so we thought why not have something festive in my bedroom. We got this mini-Christmas tree, which sits quite proudly at the edge of my dresser. I chose a gold bauble theme this year and have littered some tinsel and multi-coloured fairy lights around my room, as well as a Santa hat on my headboard. If you look closely, you'll see my reflection in the mirror (Nia)! 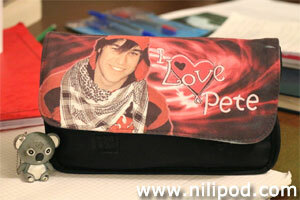 We both love Pete Wentz (from rock band 'Fall Out Boy') and Nia decided to get herself a pencil case with Pete's picture on the front. Obviously, it was immediately known as the Pete Wentz-il case and our friends at school seem to like it as much as we do. 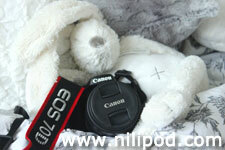 The cute little koala at the front is Nia's USB key / drive thing. Hello! 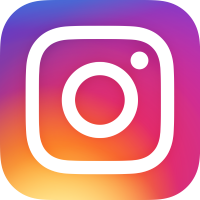 Our thing of the week this week is our Instagram account. 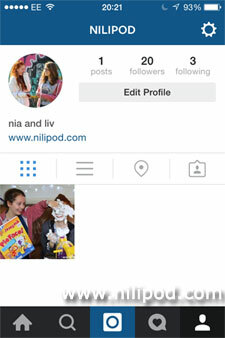 We made it last week, and it's definitely worth a cheeky follow. The photo of Liv pretending to be in the sewers on the Hunger Games is so funny, although Jennifer Lawrence doesn't look too impressed in the background. 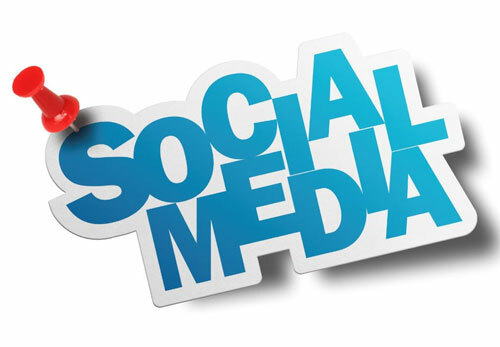 Take a look and see what you think. 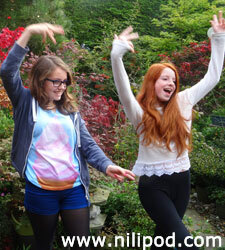 We'll be posting photos several times a week with a caption to explain all about them, just in case it's not obvious. 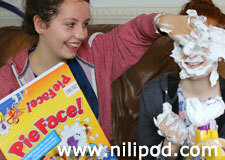 Well, you can't beat a comedy custard pie in the face and this game takes this to another level. We had a go with some spray cream and shaving foam, and basically we both got completely covered. What a mess, but it was a lot of fun, that is until we had to clean it all up afterwards! 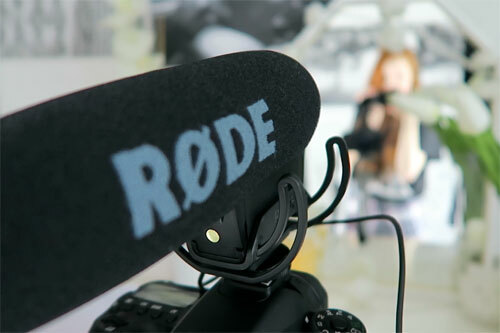 We love taking photos and making videos, and somehow we've managed to get a new camera. 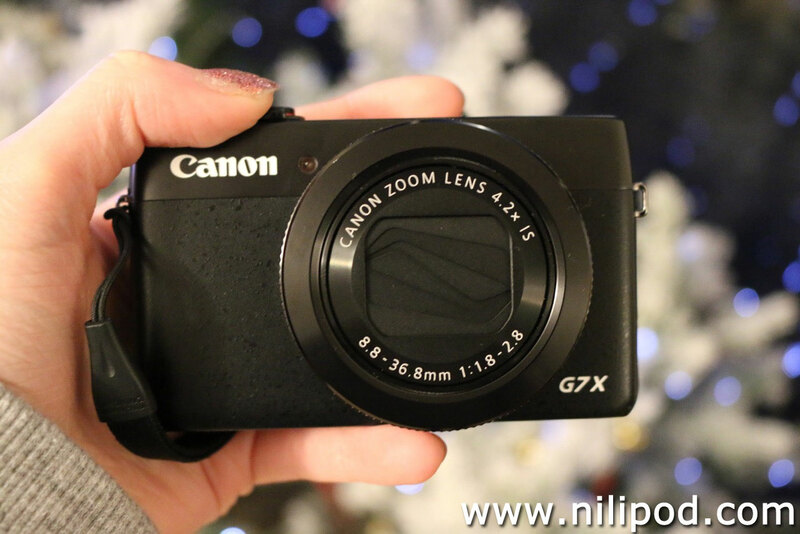 Before, we were using a Canon EOD 600D, but now we've upgraded this to a Canon EOS 70D, just like Zoella's. It is awesome, although we haven't really read the instruction book yet and so it took a while to work out that the video camera had to be in 'movie mode' to make the auto focus work, duh. The picture also shows Jeremy Kyle, Nia's cute fluffy white and grey rabbit toy, who is having a go at working the controls. He's already better than we are! Introducing Mr. Riff Raff, the mechanical Halloween butler from Asda. This life-size butler is really, really creepy and when it is plugged in, its head turns and its eyes move from side to side. We had it in the hallway the other day and it kept making us jump every time that we came downstairs. Now that the October spookiness is over, he's gone back to his home for the rest of the year - up the loft that is! Liv found him a little on the creepy side and was quite pleased when he went. 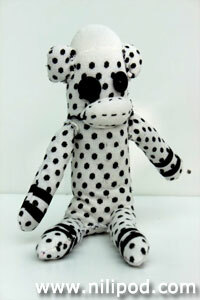 Meet Tyler, Liv's really cute black and white dotty homemade sock puppet. It looks a little bit like one of the spotted dogs from Disney's 101 Dalmatians, perhaps if you use your imagination just a little bit and squint when you look at it. Liv made it at school for a textiles project, which she clearly aced. It was made using a pair of old socks, a couple of black buttons and some stuffing. She wants to make it very clear that Tyler was designed to be imperfect, with wonky eyes, because 'Perfection is boring, individuality is better.' There's no denying that it is very cute, even if the face does look a little sinister. 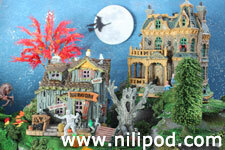 Well, as it is getting close to Halloween now, our 'Thing of the Week' simply has to be this awesome model Halloween village, which Nia set up in her lounge. It has haunted houses with flashing lightning, dancing witches, zombies, vampires, a headless horseman and lots of tiny Fimo pumpkins, which are actually quite cute. It looks best at night, when it is lit up with coloured lights. 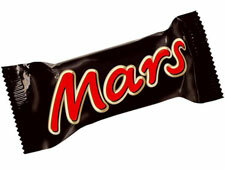 Well, apart from our recently revamped website and our latest podcast, this has to be the humble Mars Bar. We've got a pack and are ready to give them away as prizes, so if you've tuned in and listened to our chit-chatting, you'll know what we're talking about. Yes, we've reached 10 subscribers on our YouTube channel. Anyone for a Mars Bar then? They're even better when they've been battered and deep fried. Mmmmm.